Centre West | Congratulations Hat-Trick! Our Hat-Trick Team were recently awarded the prestigious Sport Newcastle ‘Team Community Award 2015’ at the INTU Sport Newcastle Annual Awards. The team received this recognition for being the project that has contributed most to the community. 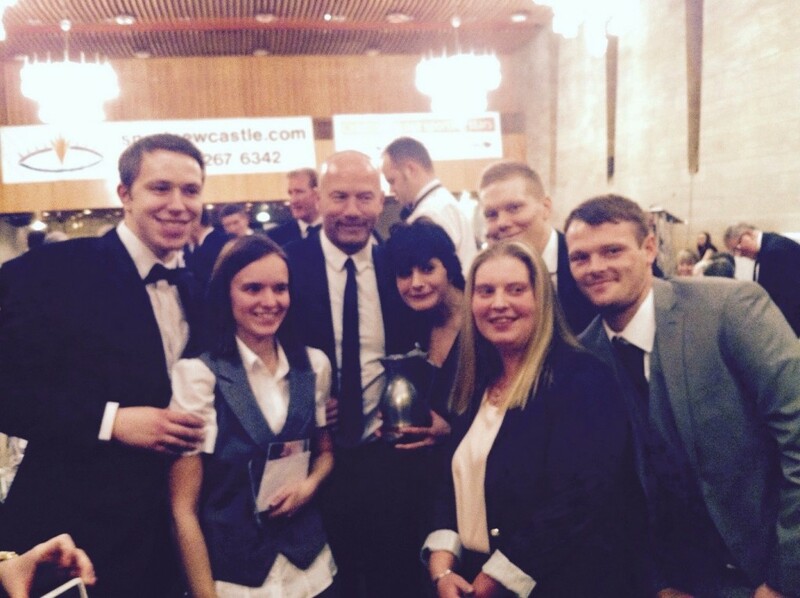 The full team attended this black tie event held at Newcastle Civic Centre which also had the Newcastle United striker Alan Shearer in attendance. Keith Parsons, Community Sports Manager for Hat-Trick commented that the award was the culmination of another year of hard work from Hat-Trick, particularly all the staff who deliver sessions with the help of younger coaches and local volunteers and we are delighted that the quality of our work has been recognised by Sport Newcastle. The team work with thousands of children and young people each week both in the West End and East End of Newcastle; they use sport as the tool to encourage development and impart a life long participation in sport. Hat-Trick deliver sessions that work with a range of ages; there is sure to be something there for you! This award follows a number of awards the team have won including StreetGames ‘Most Innovative Project’ and ‘Volunteer Project of the Year’. Emma Brown, Hat-Trick’s Football Development Officer, was also nominated for the Sunday Times/ Sky Sportswoman of the Year award at the end of 2014. Centre West would like to say a big thank you and congratulations to Emma, Keith, Dwayne, Kate, Becky and Stu and not forgetting the coaches and volunteers that contribute their time and energy to make Hat-Trick the success it is.